After a scaling down of its Western business over the past few years, Gree finally pulled the plug on all of its operations in the region in July 2017. This resulted in the Tokyo-headquartered outfit closing studios in San Francisco, Berlin and Melbourne, with a renewed focus on its core Japanese market. This move wasn't without warning though. Gree trimmed 30% of its San Francisco-based staffers and shut down its Vancouver office back in 2015. It's a sad turn of events for a company that seemed to have nailed its East-to-West transition back in 2012 with the acquisition of US mobile developer Funzio for $210 million. So why has Gree now decided that Western markets are no longer worth its attention? To try and get a sense of the reasoning, PocketGamer.biz took a look at how a selection of its games have fared in the US top grossing charts. An enduring Western hit for Gree, picked up as part of the aforementioned Funzio acquisition, has been Modern War. Originally launched way back in 2011 - one of the first military-themed MMOs in a burgeoning mobile market - it debuted in the top 10 on the US iPhone grossing charts. Its success continued under Gree's stewardship, remaining solid in the top 50 throughout the vast majority of 2012 and 2013. 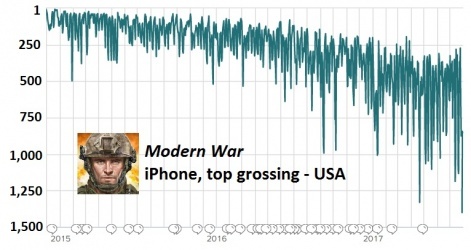 By 2015 Modern War was beginning to fall away somewhat, regularly occupying the 100 to 200 spots in the US iPhone grossing charts. But even then it was a solid earner, with grossing spikes that year propelling it as high as 21st. Natural decline continued in 2016 and 2017, its performance more erratic but showing glimpses of a still-profitable title. In 2017 so far, its US grossing rank has reached as high as 196th (March 20th) and sunk as low as 1,198th (July 31st). The peaks aren't bad for a game approaching its sixth birthday, and on Google Play it's fared even better. Launched almost a year after the iOS version in September 2012, it immediately made an impact on Google Play's US grossing charts and only dropped out of the top 50 once before 2014. Even now it's a solid presence within the top 500 grossing positions. With Modern War by now already proving a valuable asset to Gree, Knights & Dragons followed in December 2012. The RPG was the first Funzio-developed game to launch following Gree's acquisition. Its performance further proved the deal to be a shrewd one, with the game overcoming a sluggish start to hold down a regular top 50 spot on the US iPhone top grossing charts for much of 2013 and 2014. Knights & Dragons remained in the top 100 for large parts of 2015, while in 2016 and 2017 it has become less consistent. However, it still remains largely within the top 500. Crime City by Funzio has seen a similar traectory, while Kingdom Age has been in freefall since 2014 and now appears only intermittently in the US iPhone grossing charts. Gree's most recent mobile title for a Western audience is DragonSoul, which it acquired from US developer PerBlue in October 2016 and has been running ever since. But the purchase appears to have come just after the crest of its wave, with 102nd on May 28th 2016 its current US iPhone grossing peak. Since Gree's acquisition it has mostly bounced around the 150th to 300th, making it a decent if unremarkable performer. Looking at this selection of games - some of which have shown remarkable longevity - it can be difficult to see exactly what prompted such drastic measures from Gree. But with its main crop of Western titles coming from that Funzio deal, now long past their best years in terms of performance, Gree seemingly had no answer to how it should replace them as their revenues decline. Gree had a strong-yet-declining audience, with no idea how to either migrate or revitalise them. Small-scale acquisition deals, like in the case of DragonSoul, can make for canny investments but are unlikely to be a major income source. For that, Gree's hopes rested in the game being developed at its Melbourne studio. “It's ambitious in terms of scope, and in terms of our hopes for business outcome,” Shanti Bergel told PocketGamer.biz back in January. But with that studio now closed, it was clearly decided internally that the cost of finishing and launching the game would outweigh the potential profits. Simply, Gree found itself with a strong-yet-declining audience in ageing titles, but with no idea how to either migrate or revitalise them. “Sometimes the games get old and they need a massive technological upgrade, but sometimes that's dislocating and the players actually enjoy the older game,” Bergel told PocketGamer.biz in January. Compare that to Gree's Japanese "release blitz", and it's easy to see why the firm is shifting its priorities. A far cry from its Western uncertainty, Gree clearly understands how to make a mobile hit in Japan and has built a system that allows it to do so very quickly. A recent example is Danmemo, which launched in Japan in June and almost immediately shot to ninth in the country's iPhone grossing charts. It's remained solidly within the top 100, and mostly in the top 50, sitting at 44th as of July 31st. A great deal of time and money would have been needed for Gree to land another hit on this scale in the West, and the Funzio days are beginning to feel more and more distant. With this in mind, sad as any closures and job losses are, Gree's reasoning for closing its Western operations becomes much clearer. Whatever happened to Fire Emblem Heroes? 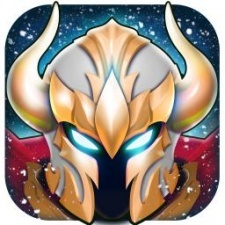 Knights and Dragons was developed by my colleagues at IUGO Mobile Entertainment, not Funzio.